One way creators try to leave their stamp on company-owned characters is to raise the stakes of a story. "I told the biggest ________ story ever," they want to say as they move on to other work. Of course, raising the stakes in a Fantastic Four book, considering that the original creative team of Jack Kirby and Stan Lee put the heroes in a situation in which Earth was threatened by a planet-eating demigod with a device that could destroy the universe, is a particular challenge. Yet recent creative teams have risen to it. 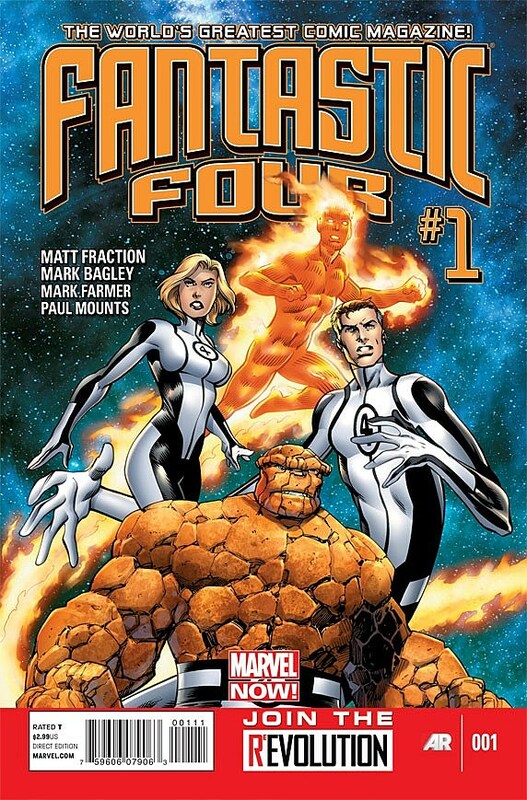 Mark Millar and Bryan Hitch oversaw the introduction and destruction of a whole new Earth; Jonathan Hickman and a handful of artists created a companion title, FF, depicted a whole council of Mr. Fantastics, grew the cast considerably and had the Human Torch lead an army against a horde of other-dimensional monsters. 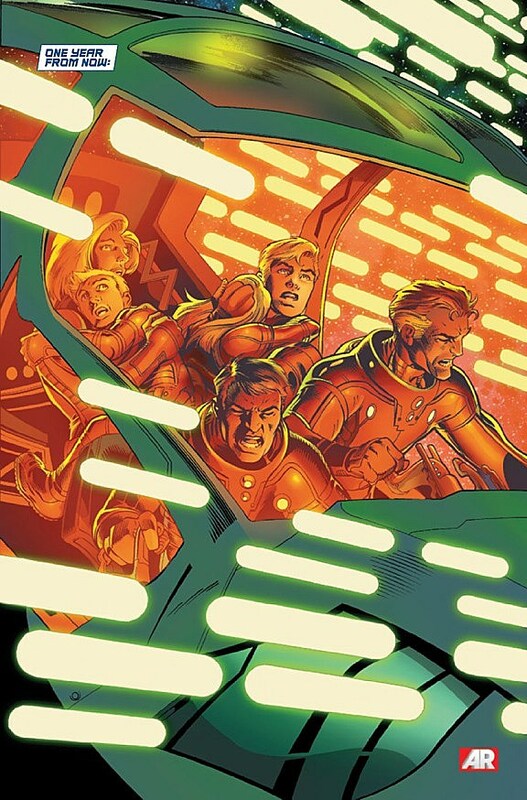 So it was worth wondering, as Matt Fraction, Mark Bagley and Mike Allred started their runs on Fantastic Four and FF, just how the stakes could get any higher for Marvel's first family. The answer is that they don't. The stakes are lower. And it's just what these books needed. 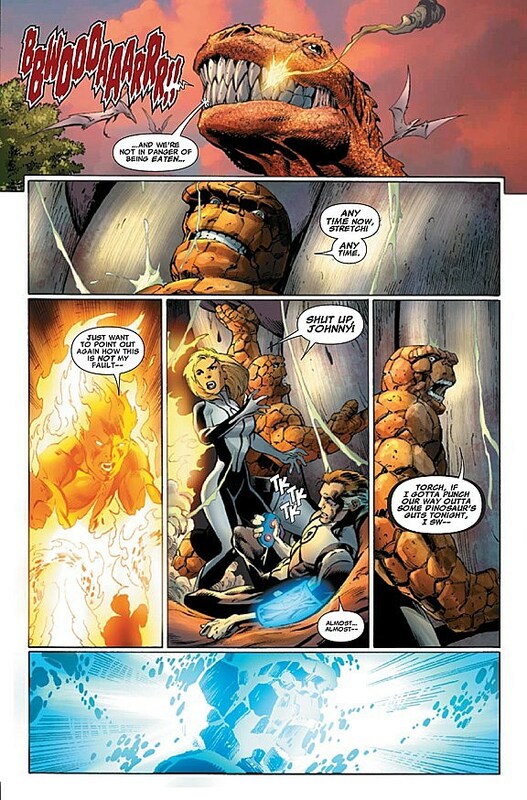 I know it seems odd to say anything that begins with a child being attended to by a team of robot moms and the titular heroes inside the mouth of a tyrannosaurus rex nearly three million years in the past is "small" in any way, but Fantastic Four #1 essentially amount to the story of one man dealing with some bad news. 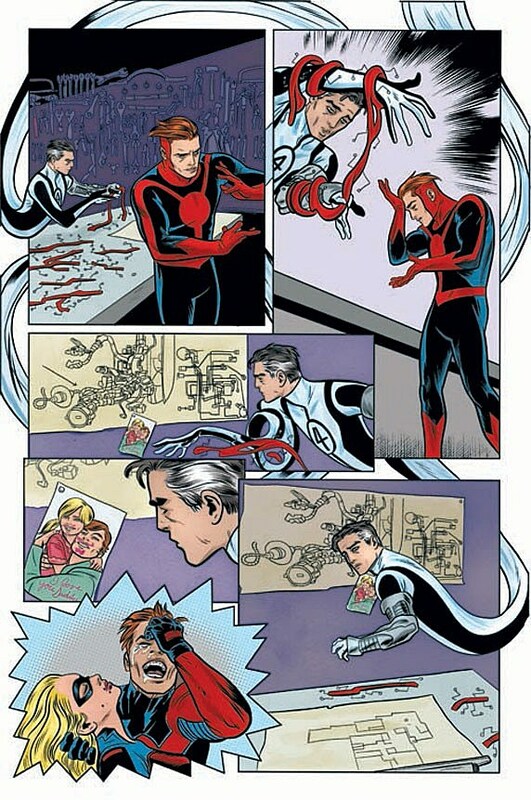 Reed Richards has long been characterized as someone who constantly thinks about the world outside himself, often forsaking time with his family and his own wellbeing for the sake of the next big idea. 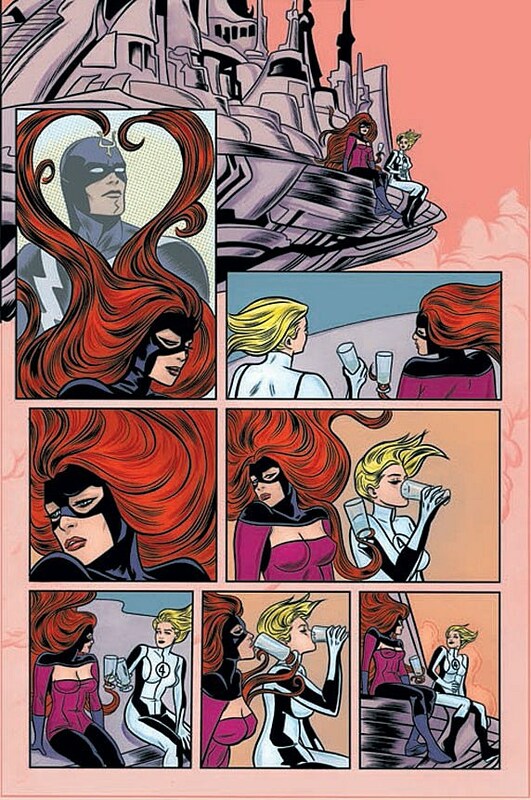 What writer Matt Fraction does in this issue is force Reed to look inward, at least momentarily. He has to decide what's really precious to him and devise a way to keep it, while making the experience of discovering that solution something his children will remember fondly. Admittedly I balked a little when I heard that Mark Bagley, who spent years cranking out issues of Ultimate Spider-Man, was taking over Fantastic Four -- not because I disliked his art, but because I wondered how well an artist I tend to associate with the personal drama of Spider-Man would fit on a book Jack Kirby established as one where everything was bigger than big. As it turns out, he's an inspired choice for this particular story. Though there are certainly scenes of big adventure (and there's at least one big panel of some Kirby-esque interstellar technology), the bulk of Fantastic Four #1 is highly personal, dramatic and emotional. Bagley's characters have always worn layers of emotion on their faces and in their body language; he nails the expressions here, too. When I say the stakes are lower, I don't mean that these issues are devoid of big ideas. 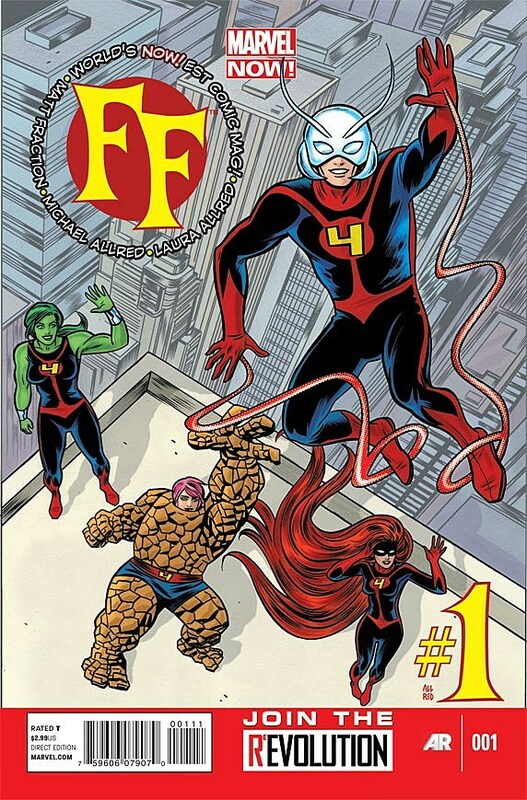 Also written by Fraction, FF #1 revolves around the preparations for the team's big trip into unknown territory, not all that unlike the big trip Reed, Sue, Johnny and Ben took in the first Fantastic Four #1 (51 years ago this month) that resulted in their extraordinary powers in the first place. Someone has got to head up the Future Foundation in their stead, so the family goes recruiting. What's terrific, though, is that the FF are recruiting a new team to take over for all of the four minutes that they'll be absent (though to the Fantastic Four themselves, the journey will be a full year). It's a really nice way of showing that even when the stakes seem small, something could go colossally wrong if Mr. Fantastic and the Invisible Woman take their hands off the wheel for even the briefest of periods. It's Fraction's way of telling us that for these charaters, even the small stuff can have major repercussions. Of the four members of the new team, we spend the most time with Ant-Man (and this is the Scott Lang version, not Hank Pym or Eric O'Grady). It makes sense; he's dealing with his own recent loss and isn't sure if he wants to take on the responsibility. But I have to say I'm anxious to see more of Darla Deering, a.k.a. Miss Thing. 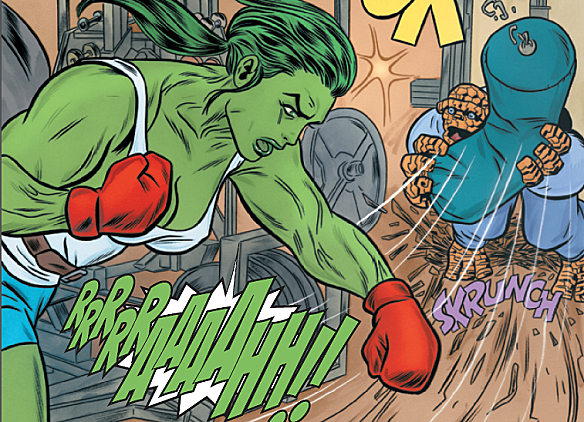 She-Hulk and Medusa both get brief scenes, the former with The Thing, the latter with the Invisible Woman, that remind the audience quickly of their character statuses. Miss Thing is brand new to the world of FF and we don't get much more information beyond that she's famous and she's the Human Torch's girlfriend. She's not even really an official part of the FF team by the end. Fraction had a lot to accomplish in these two issues, I know, but the tease of getting to see a promising character like Miss Thing, then have her not even appear in costume, seems near cruel. I was really surprised by how closely these two #1 issues were tied to one another. 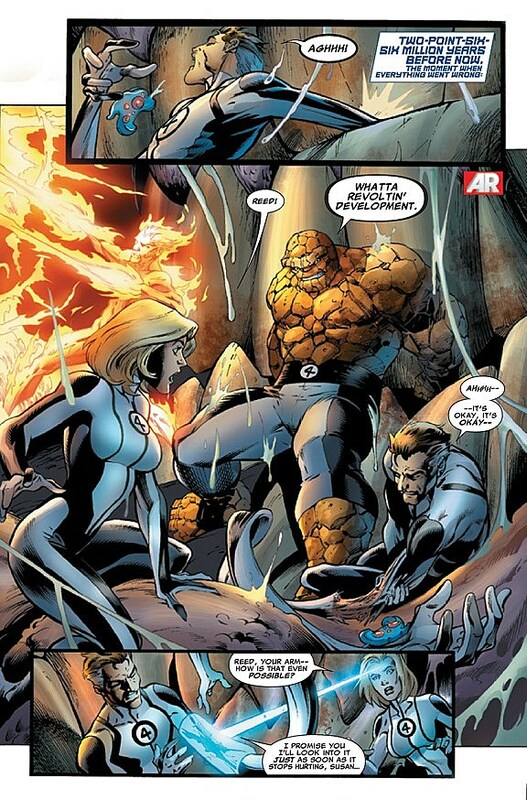 They aren't just loosely connected; FF was a direct continuation of what happened in Fantastic Four. For the kick-off, that's fine. It gives us readers a feeling that something of real importance is taking place, and it'd frankly be kind of weird to see Reed show up in FF driven by anything but the motivating force he discovered in the other title. That said, I hope the two titles can break away from each other in the months to come. They each have distinct personalities and aesthetics, despite having the same writer, and I'm particularly interested to see what kinds of territory this new direction for FF can mine. While we're on the topic of surprises: I was also caught off-guard a little bit by how closely Fraction retained the very different status quo Jonathan Hickman set up in his run on these two books. Other Marvel NOW! relaunches have more fully reset things to square one, whereas these issues could just as easily have the numbers #612 and #24 on the covers. 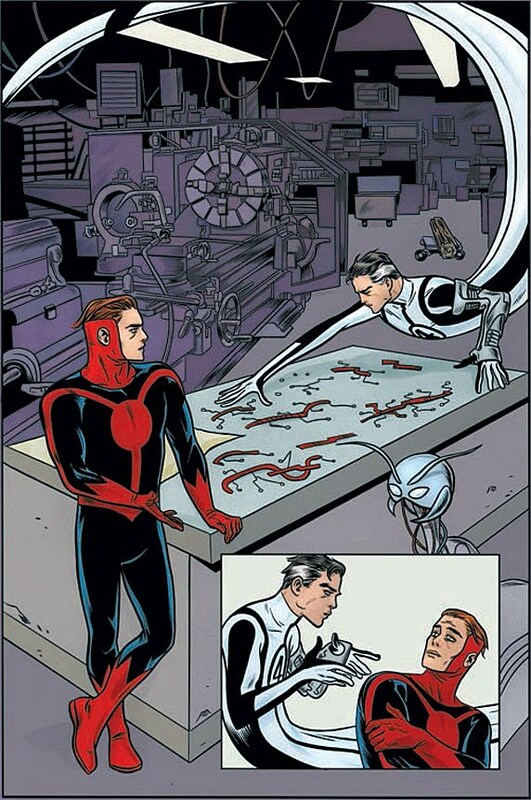 While that may not be the most effective way to draw in new readers, I do have to give Fraction credit for trying to introduce the various and sundry characters of the Future Foundation in about as new-reader-friendly a way as one could imagine. Plus, it would be a shame to tear down all this new, interesting architecture Hickman designed over the past few years. That would be like trying to wipe away everything Grant Morrison did to reshape Batman's world for the last several years. 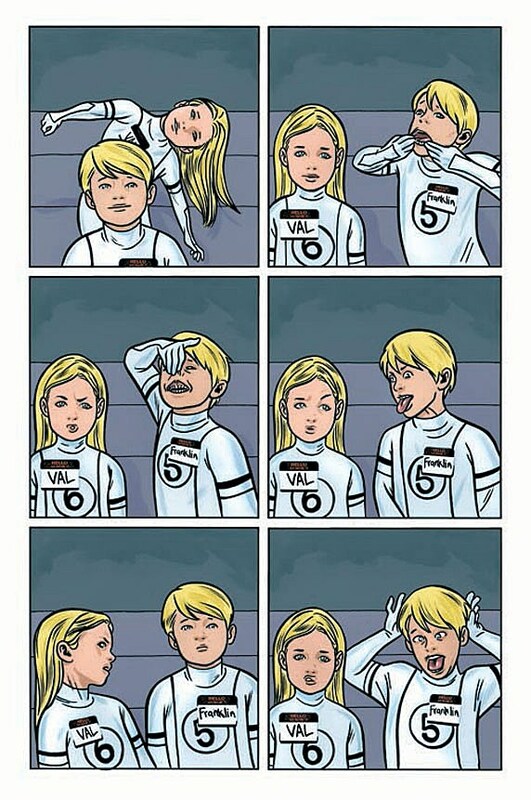 Fraction's biggest break from Hickman is in the type of story being told. These characters are still exploring the vast reaches of their own universe and others, but it's less about the pure act of discovery and more about discovering something they need to help or honor the people they love. 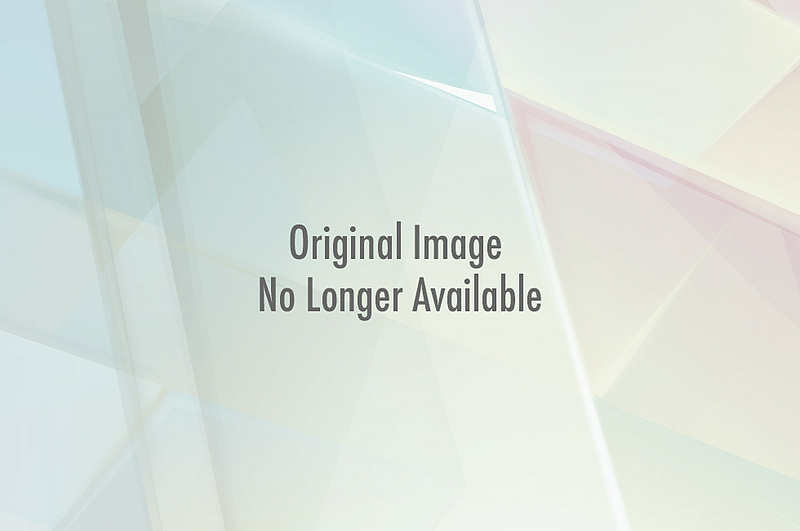 Hickman's work on these books were about various types of society, you might say. Fraction's is about a few different kinds of family.